There’s something about the idea of a human being trapped inside a beautiful wild animal that I find incredibly tragic and romantic at the same time. So for District 13, the YA discussion and craft swap group I recently founded, I thought it’d be fun to exchange handmade bookmarks featuring werewolves as the theme. 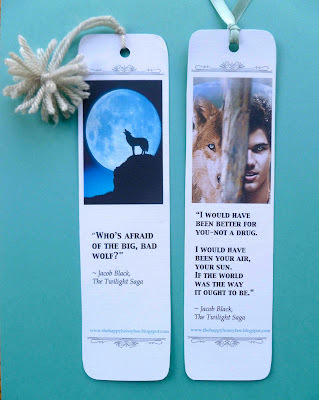 The rules were that you were to make two bookmarks, one based a YA werewolf book your partner really enjoys and one based on a werewolf book you enjoy. Me being me, I went ahead and made four bookmarks total since I always like to go a little above and beyond–plus it’s always hard to narrow down choices for these things, too! 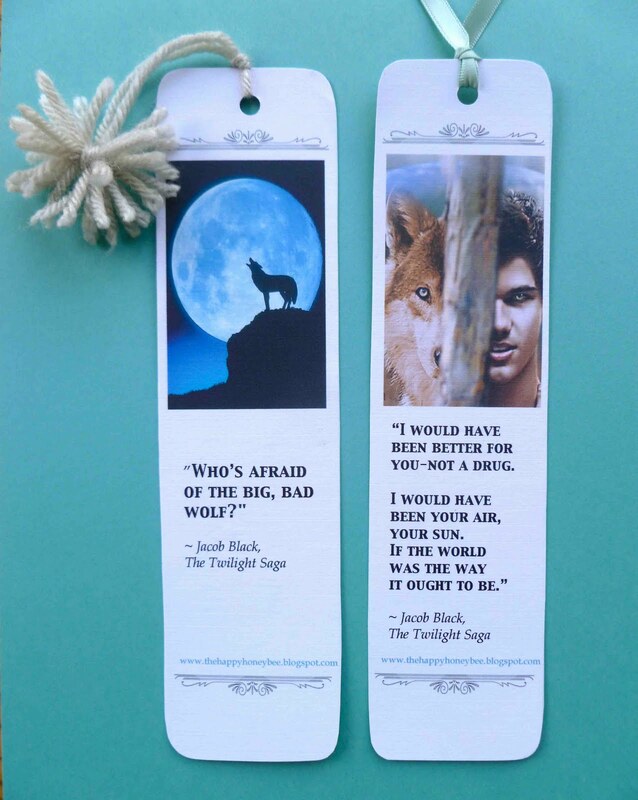 My partner is a fan of Twilight, so I chose two Jacob Black quotes for her, paired them with some images I found online, and printed them onto nice linen cardstock and embellished them with ribbon. 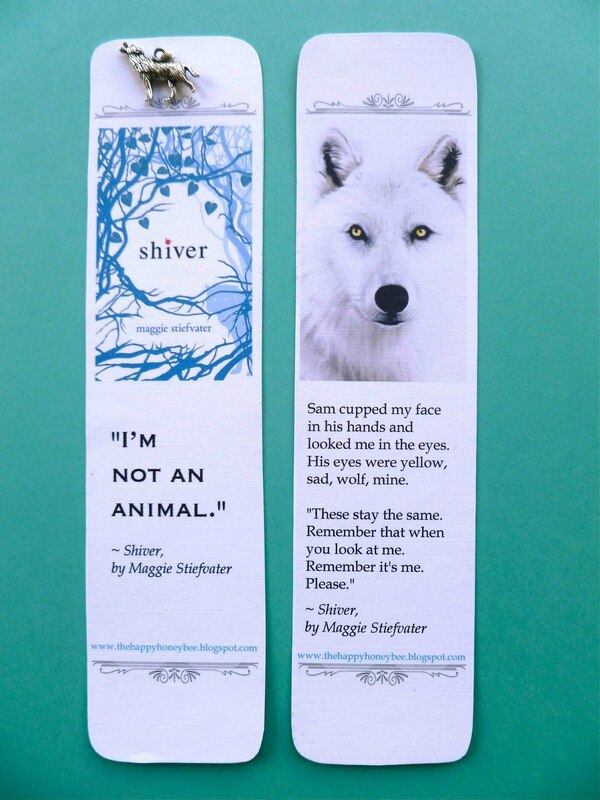 I chose Maggie Stiefvater’s Shiver as the basis for my bookmarks, since it’s one of my favorite YA books of all time. It’s the story of a girl who sees a wolf behind her house for years, until one day, she sees that he’s hurt and tries to help him, only to discover that he’s actually a boy who transforms into a wolf when it gets cold. The story is lovely, lyrical, and achingly sad…and it brings tears to my eyes every time I read the author’s description of Sam’s desperate struggle to hold onto his humanity. It’s the most gorgeous take on the werewolf story I’ve ever read, and I can’t wait for the third book in the series Forever to be released this summer. My favorite quote from the book is featured in one of the two bookmarks, and I used a tiny silver wolf charm for the other that I sewed onto the bookmark with silver thread. My partner really liked all of the bookmarks she received, and I was pleased enough with how they turned out that I had to make myself a set, too! 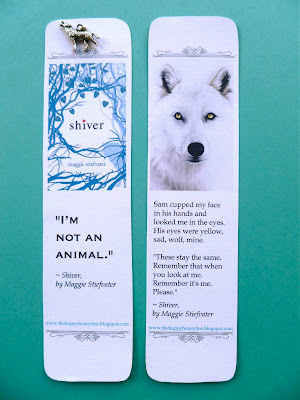 OMG the shiver bookmarks are absolutly gorgeous :o !! !